The 2011 Grammy Awards were held tonight at the Staples Center in Los Angeles. The telecast only contained a portion of the 109 categories, yet still ran three-and-a-half hours long. The show was dominated by rappers and country singers. For the most part, it didn't really really come to life. A number of the performers clearly lip-synched their acts. The older performers such as Bob Dylan and Barbara Streisand were simply dull. Unfortunately, Aretha Franklin wasn't well enough to attend, and was paid a lengthy tribute by singers Christina Aguilera, Jennifer Hudson, Martina McBride, Florence Welch and Yolanda Adams. After her Superbowl fiasco, Christina Aguilera acquitted herself well. She outshone Jennifer Hudson, who had trouble hitting her notes. 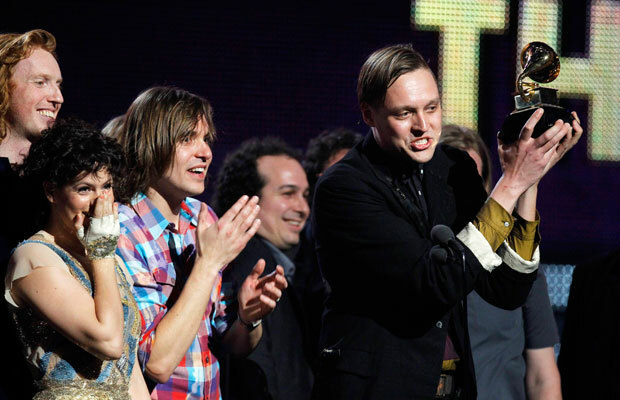 The sleep-inducing Lady Antebellum won five of their six nominated categories, but were upset in the Album of the Year category by Montreal-based band Arcade Fire for their album The Suburbs. A surprised lead singer Win Butler said, "I just want to say thank you, merci, to Montreal, Quebec, for taking us and giving us a home and place to be in a band," before launching into an impromptu second number to end the show. That finale was the lone bright spot in the telecast show for Canadian music fans as Drake and Justin Bieber were big losers. Both were defeated by surprise winner Esperanza Spalding for the Best New Artist award. She becomes the first jazz artist to win the category. In the pre-awards shows, Neil Young managed a single win in the Rock Song category for "Angry World" and Michael Bublé won Traditional Pop Vocal Album for Crazy Love. Lady Gaga claimed three prizes including Best Pop Album. Muse won the Grammy for Best Rock Album. The Classical Album and Choral Performance awards went to Verdi: Requiem performed by the Chicago Symphony Orchestra and the Chicago Symphony Chorus. Canadian pianist Marc-André Hamelin was nominated for Best Instrumental Soloist Performance (without Orchestra), but that was won by Paul Jacobs for his disc of Messiaen. Soprano Cecilia Bartoli defeated Canadian soprano Measha Brueggergosman for the Best Classical Vocal Performance award. The Elora Festival Singers conducted by Noel Edison lost in Best Small Ensemble Performance to Hespèrion XXI & La Capella Reial De Catalunya. But l'Orchestre symphonique de Montréal conductor Kent Nagano won Best Opera Recording for his recording of Kaija Saariaho's L'amour de loin (Love from Afar) with Deutsches Symphonie-Orchester Berlin. Pop Performance by a Duo or Group With Vocals: Train, "Hey, Soul Sister (Live)"
Traditional R&B Vocal Performance: John Legend & The Roots, "Hang On In There," Wake Up!R&B Song: John Legend & The Roots, "Shine," Wake Up! Male Country Vocal Performance: Keith Urban, "'Til Summer Comes Around"
Country Performance by a Duo or Group With Vocals: Lady Antebellum, "Need You Now"